Free of charge: for EU citizens under 18 65 years old. The morning of 24 August AD 79 was a day like any other. In the town of Pompeii, the inhabitants were living their lives as always. Suddenly in the air a deafening crash resounded and the ground started to shake. Few hours later Pompeii and other nearby towns were completely buried under several metres of pumice and ashes, in the same tragic fate. This private 3-hour tour with a private English-speaking guide will introduce you to the destruction and excavation of Pompeii with a look at the town and its history, its houses ans shops, relating them to the people who lived there. Moreover it also takes a look at the places of relaxation and entertainment like the baths, the theatres and the amphitheatre. Pompeii was discovered in the 1590s, but it was not until 1748 that exacavations really began. In the 1860s, an Italian archeologist named Giuseppe Fiorelli pionereed the technique of pouring plaster into the impressions the rotted bodies had left in the ash creating detailed plaster casts of the victims in their final moments. Nearly 2000 years later, Pompeii gives us an incredibile record of everyday life at the time of Roman Empire. 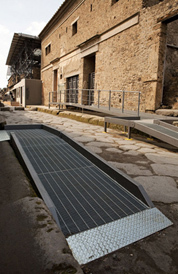 Tredytours offers a rental service of audio receivers kit, ideal system for visiting the ruins of Pompeii.The communication will be clear in any weather condition and this system will help tourist guides in their job. The tourist guide will be endowed with a transmitting radio with relative accessories (microphone and lace). Every component of the group can use a receiver with its accessories (disposable earpiece and lace). A qualified personnel will offer a continuous technical support to face any further demand of the guide or of a component of the group. The cost for this service is of 2 EUROS per person.